Personalized lip balm tins are favored over lip balm sticks due to their high aesthetic value and pack larger quantity material than regular chapstick. Over the years lip balm tins printed in pretty hues have become popular due to their high cosmetic and prosthetic value. Advertisers find it easier to gift custom printed lip balms because it offers best results for miniscule investments. 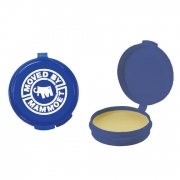 Customized promotional lip balm tin makes a best gifting choice for advertisers who are working in typically lower budget because they can gain easy attention with minimum efforts. Those who have made their mind in investing in lip balm tins have following choices to tend.